Vratza (or Vratsa) became famous with the discovery of the largest cache of treasure found so far in Bulgaria. In 1986, a cache of gold and silver objects—jewellery and ornaments, tools, utensils, vases and vessels—belonging to a noble Thracian family that lived in the 4th century BC was uncovered in the village of Rogozen. There are some more recent attractions in Vratza: the monasteries of Cherepish, Strupesh, and the monastery of the Archangel Michael are all open to visitors. A memorial built in honor of Bulgaria’s poet-revolutionary, Botev’s Path, begins at the site of the Radetzky steamboat, and ends in the place where Botev met his heroic demise. Vratza has many protected areas, including the much-visited Hristo Botev Nature Park (named after the poet and revolutionary who fought and died in the area), the beautiful rock formations of the Vrachansky Karst Reserve, the multi-chambered Ledenika Cave, and an old oak forest called Kitkata (“cluster”) near Byala Slatina, the place where Botev met his death. The town of Vratza at the foot of Vratza Mountain is a great starting point for nature excursions—to the Vrachanski Balkan Nature Park, a beautiful, forested stretch of the mountainside with many gorges, chasms and caves, including one of the municipality’s tourist attractions, Ledenika Cave, the most visited cave in Bulgaria. Accommodations for visitors to the cave have even been set up in the neighbouring villages. The park is also being developed as a site for ecotourism and extreme sports, for lovers of activities from spelunking to paragliding. 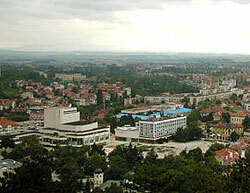 Vratza is one of the country’s most economically developed urban areas. It has a relatively low cost of living and is well connected to Sofia’s international airport and some of the country’s major ports. From Sofia, Bulgaria’s main railway goes through Vratza on its way to Vidin in the northeast.